The Centre for the Study of Governance Innovation (GovInn) and the Department of Political Sciences at the University of Pretoria invite you to join us on Friday 3 February for a discussion on the changing landscape of international relations with Professor Oliver Stuenkel (Getulio Vargas Foundation) and Dr Frank Mattheis (GovInn) who have both recently released books on the topic. The session will be moderated by Department of Political Sciences lecturer Sithembile Mbete. In this provocative book Post-Western World: How Emerging Powers Are Remaking Global Order (Polity, 2016), Oliver Stuenkel argues that our understanding of global order and predictions about its future are limited because we seek to imagine the post-Western world from a parochial Western-centric perspective. Such a view is increasingly inadequate in a world where billions of people regard Western rule as a temporary aberration, and the rise of Asia as a return to normalcy. The volume The New Politics of Regionalism. Perspectives from Africa, Latin America and Asia-Pacific (Routledge, 2017), edited by Ulf Engel, Heidrun Zinecker, Frank Mattheis, Antje Dietze and Thomas Plötze, brings together innovative contributions that focus on the role of regional actors and the making and interplay of regionalisms in the processes of reshaping social spaces within an evolving global order. 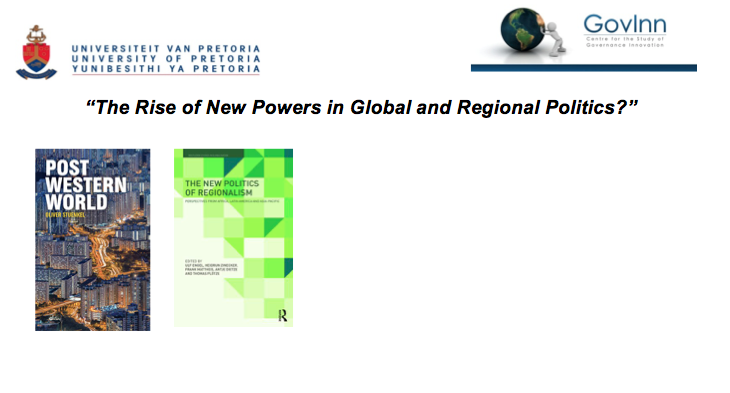 Analysing these new regionalisms from the perspective of the Global South, the contributions in the volume departs from state-centred perspectives and focusing on the transformations and constructions of regionalisms across varying spatial dimensions. Oliver Stuenkel is an Associate Professor of International Relations at the Getulio Vargas Foundation (FGV) in São Paulo. Frank Mattheis is a Senior Researcher at the Centre for the Study of Governance Innovation (GovInn) at the University of Pretoria. Sithembile Mbete is a Lecturer in the Department of Political Sciences at the University of Pretoria.